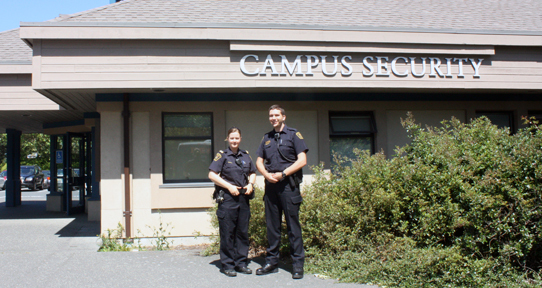 The Campus Security Building is located near the bus loop and UVic Bookstore. Campus Security Services reports to the Vice President, Finance and Operations and is led by the Director of Campus Security. The units; Security, Parking, Motor Pool and Emergency Planning - report directly to the Director. For a full overview of the department, click here - to see the Campus Security organization chart. Tom is responsible for the direction and leadership of the department and crime prevention initiatives on campus. Patrick is responsible for parking operations, departmental administration, budget and transportation on campus. Keith is responsible for the day to day security operations on campus. The Emergency Planning Manager is responsible for UVic's emergency planning program, ensuring that plans and procedures are in place if and when large emergencies occur on campus. Allison and Fiona provide support and referral for all personal safety related concerns, as well as coordinating the crime prevention programs and safety and emergency program education for the campus. Emily is responsible for alarm systems, Security Officer scheduling and the CSEC website.